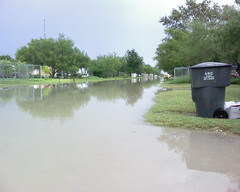 We had some heavy rains here in Mission, Texas for a short period yesterday. It was enough to flood our street. It drained in a few hours. This is why hurricanes and heavy rains upstream on the Rio Grande are a concern around here. This is why it was so important for Congress to appropriate money to strengthen the levee system that protects. us.